798 pages | 320 Color Illus. The study of economics should not be highly abstract, but closely related to real-world events. 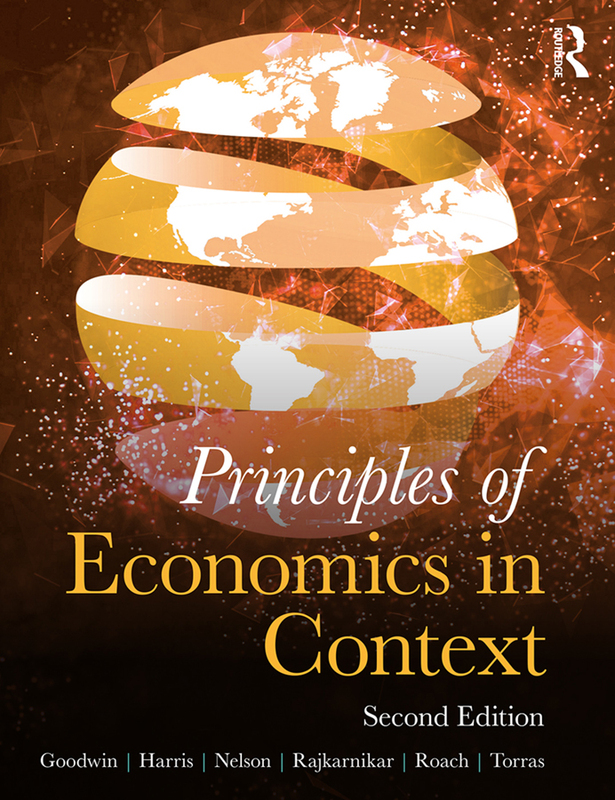 Principles of Economics in Context addresses this challenge, laying out the principles of micro- and macroeconomics in a manner that is thorough, up to date and relevant to students, keeping theoretical exposition close to experience. Emphasizing writing that is compelling, clear, and attractive to students, it addresses such critical concerns as ecological sustainability, distributional equity, the quality of employment, and the adequacy of living standards. - Full complement of instructor and student support materials online, including test banks and grading through Canvas. - A glossary at the end of the book containing all key terms, their definitions, and the number of the chapter(s) in which each was first used and defined. - New material on climate change policy; a new section on “The Economics of Renewable Energy”. This new, affordable edition is ideal for undergraduate economics courses. It combines the just-released new editions of Microeconomics in Context and Macroeconomics in Context to provide an integrated full-year text covering all aspects of both micro and macro analysis and application, with many up-to-date examples and extensive supporting web resources for instructors and students. A2. An Algebraic Approach to the Multiplier, with a Proportional Tax Chapter 26: Money, Banking, and Finance 1. Why Money? Neva Goodwin is Co-Director of the Global Development and Environment Institute (GDAE) at Tufts University, where she is the director of the electronic Social Science Library: Frontier Thinking in Sustainable Development and Human Well-Being. Her current interests focus on ecological restoration, especially with regard to soils. Jonathan M. Harris is Senior Research Associate at the Global Development and Environment Institute at Tufts University. His current research focuses on the implications of large-scale environmental problems, especially global climate change, for macroeconomic theory and policy. Julie A. Nelson is Professor of Economics at the University of Massachusetts Boston and Senior Research Fellow at the Global Development and Environment Institute at Tufts University. Many of her books and articles critique economic methodology from a feminist perspective. She has published in journals ranging from Econometrica and the Journal of Political Economy to Hypatia: Journal of Feminist Philosophy and Ecological Economics. Pratistha Joshi Rajkarnikar is a Postdoctoral Scholar at the Global Development and Environment Institute at Tufts University. Her research covers a broad range of topics on women’s empowerment, economic development, and the impacts of globalization on developing economies. She has taught economics in visiting positions at Trinity College and University of Massachusetts Boston. Brian Roach is Director of the Theory and Education Program at the Tufts University Global Development and Environment Institute, and a lecturer at Tufts and Brandeis Universities. He specializes in environmental economics, and is co-author (with Jonathan Harris) of Environmental and Natural Resource Economics: A Contemporary Approach. Mariano Torras teaches economics at Adelphi University in Garden City, New York. A heterodox economist who specializes in ecological and development economics, his recent research has been in the areas of institutional economics and economic methodology; particular attention has been on approaches to addressing climate change.